Ok, I just got done reading The Thank You Economy by Gary Vaynerchuk and have some things from it that our small business peeps should know about! 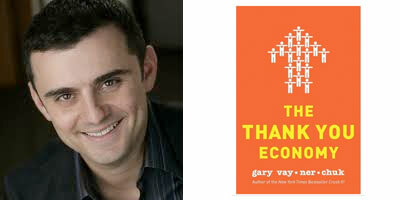 The Thank You Economy is a followup to his bestseller Crush It! and I have been following him for quite a while, liking his info, approach and delivery. The other part of living in the steel belt of America was that we knew about buying American and supporting local businesses. Our electricity came from a cooperative, not a huge corporate conglomerate and we could ask the guy who owned the welding store to get “right” colored welding caps that all the kids made popular in high school (I am sure he thought we were nuts, but he sold A LOT of welding caps). As the internet gets bigger, our connections to other people are actually becoming closer. Everyday I see a friend who is in a strange town asking where the best places to go for dinner are. Usually friends answer, BUT what if a restaurant owner was on Facebook or Twitter and “invited” her to come to his place? How powerful would that conversation be? It is best to think of Facebook and Twitter for business as if you are sitting in a diner and happen to overhear someone next to you asking a question. It is polite to lean over and tell them something great about what you do or sell (or promote a friend’s product or service). What it is NOT appropriate to do is start screaming at them, BUY MY STUFF, COME TO MY SITE, or GET INTO MY DATABASE! These interpersonal connections can sometimes seem weird to corporate types and even small business owners. They say that they don’t want to have to put their personal life out there for everyone to see. Well, too bad! In today’s day and age, people are more savvy. They know when big business outsources their call centers overseas it takes jobs away from Americans. They also know the whole story about why Dave Thomas named his business Wendy’s (after his daughter) and that Sam Walton was a basically good guy who was determined to make his (ultimately) HUGE company a decent place to work. These VERY successful men knew that they had to be the face of their business for it to succeed, same goes now! Another good bit was about how small business types need to care about everyone who is interested. YES, you have to answer all those tweets, likes and comments BUT that means someone is interested. We had a client who was VERY upset that he had to answer questions from Twitter and Facebook. His thinking was that all of that was on his website and they should go look for it there. Well, not to beat a dead horse, that is NOT HOW IT IS TODAY! Today someone will see your banner, click to your site, follow a link to Facebook to see if you talk to your customers and (gasp) have the audacity to post a question they have BEFORE they buy your product. That is the downside, the upside is that they might like your product and become an online evangelist for you! They will tweet about it to their followers, post how well it worked on their wall and generally spread the love MUCH further than they ever could have before! Lastly, I liked the part about social media and marketing in general being a marathon and not a sprint. We get new clients who are sad that they have not seen the millions of dollars of sales that they expected in the first 30 to 60 days. Sigh. This is not like putting an ad in the New York Times and watching the order roll in. Building up your networks and growing relationships is not a wham bam thing, it takes time and consistency for the masses to know that you are in it for the long haul. I have NEVER seen anything like social media for showing the flaws in a company’s sales funnel, customer service or general attitude. They can fake it for a while, but if they are in it to make big bucks and not passionate about what they do, it shines through! Gary talks about the Old Spice commercials and how well they did, and then how they drop the ball by ignoring all of the people that they had gotten interested. Their “campaign” was a sprint and the real magic would have happened if they had run a marathon! If you would like to find out more about Gary V and see him in action, take a peek at his Keynote speeches, I play them in the background when I need a kick in the pants (just watch out, they are NOT PG generally, he is a cusser!) So here is your mission, watch Gary’s vidoes, and then go buy The Thank You Economy BEFORE you decide to hire a marketing company like us to do your Social Media! It will help your success and save us both a lot of heartache down the line! Link Disclaimer – There are links in this post but they are not affiliate links for two reasons, first I wanted to give @garyvee his due with no form of profit from my end and two, stupid amazon hates affilates in colorado so I can’t use them and the google interface is so kerfufully that I have not taken the time to master it. FYI – if you do have to put affiliate link disclaimers in YOUR posts, don’t cookie-cutter them or you will start to rank for your disclaimers, distracting the google from what your site is really about. That having been said, mine are out of control so don’t copy them! Previous Post: « Small Business Marketing Magic – There is no get rich quick!